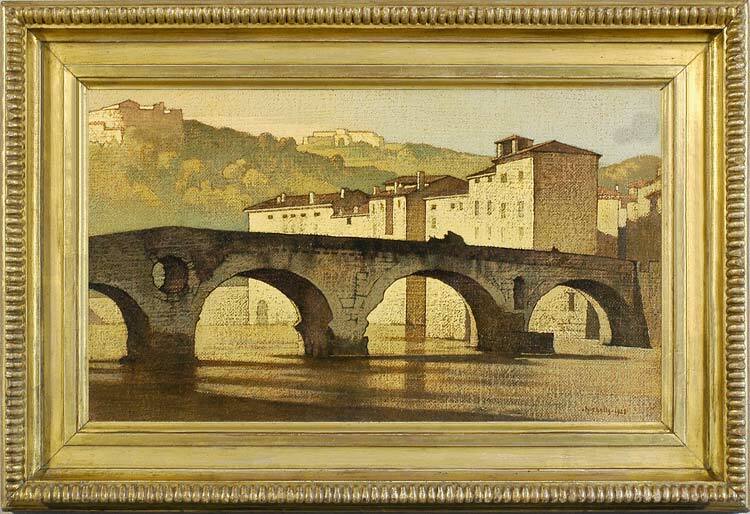 This golden, sunlit view of a bridge in Verona is characteristic of Nicholls’s work: thinly painted over a dark ground, the tooth of the canvas giving texture and a subtle tone to the paint, and the architecture rendered in solid blocks of light and shade. There is a sense of the underlying geometry of the physical world which is reminiscent of Cézanne, and an ability to synthesize and simplify which is shared with John Sell Cotman (although this was apparently present in Nicholls’s work before he had been introduced to Cotman). As well as Italy, Nicholls painted in France, Spain, and extensively in the UK, producing rural, village and urban landscapes, including images of London. His paintings share a classical, timeless sense of serenity and permanence.